Rubadiri Victor is a purest when it comes to culture and the arts. When he sacrificed seventeen years without the paint brush and his blue strokes of expression, he was fighting for that community to be respected, for the sanctity of sacred institutions to be preserved, to be kept untarnished and for the preservation of everything arts and culture. 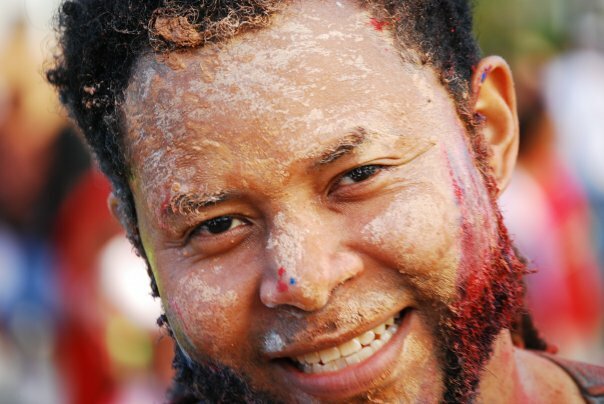 His art is a dominance of fine art and a touch of abstract; brought together to reflect the great rainbow nation, Trinidad and Tobago and the Caribbean . To reflect fragments of where we as a people fell short and to show what is possible. “The idea of fine art is that these are permanent signs, power objects that you want in spaces, generating certain kinds of energies to transform people”, Rubadiri visualizes. “Certain ones that you want in public spaces, whereas many people as possible can interact with it; and those are the massive pieces and those kinds of things …” Rubadiri noted. Layers and layers of passion, evidently flows from his mostly blue toned, calm and beautiful paintings. Check this master piece for instance — Painted by Rubadiri. He calls it the monumental ‘Secret Squadron of Blue Arch Angels’. And it stood 16ft x 8ft at 101, Holder’s Studio Gallery on Newtown Street, Woodbrook in the capital of Port of Spain, where his art exhibition was held for one week, from 28th November to 3rd, December. 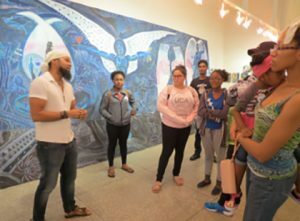 “Very nice!” declared Calvin Edwards — who walked into the Bosco Holder art gallery on Friday December 1st, stretched out his hands, threw his head back and inhaled what you might say is an air of satisfaction about the artwork that decorated the gallery. 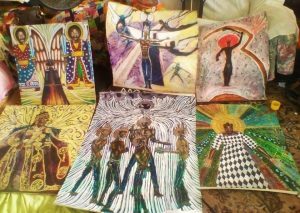 Rubadiri’s finest pieces; embellished with features of Trinidad and Tobago’s historical and sporting moments; Orisha spirit forms, Caribbean political icons and other areas of African and Caribbean cultures. The Secret Squadron of Blue Arch Angels was the most dominant welcoming piece, just 36 yards or so from the entrance of the gallery. Rubadiri seen to the left explains his thinking behind his paintings to Calvin Edwards, an attorney-at-law who showed up for the art exhibit earlier than the opening time. “This painting ‘ The Secret Squadron of Blue Arch Angels’ really needs to go into a high traffic public space. People contemplate it, sitting in front of it sometimes for hours, but it’s also fun and interactive like this” Rubadiri envisions. This is the crème de la crème of the lot. This piece cost TT$101,000.00 or US$14,994.46. We are in 2018, and this renowned artist can tell you stories about his pop art T-Shirts he did during the millennial period — the 1990’s. Generation Y, they called the youths of that era. And Rubadiri was expressing the cultural behavior of those years through the pop art he displayed on T-Shirts that “processed Trinidad and Tobago, Caribbean and African Diaspora”, young as he is. The 46-year-old is an art man, a spirit man, an educator, a writer, a book worm, a man conscious of divinity — who projects his passion from his heart. Many in his field of work do say he is an emotional man, very in touch with his feminine side, one might add. Rubadiri continues to swim against rough tides in his preferred industry of work and creation. As his love for the art form trumps the struggles he has had to endure; to show the value of the creative industries in nation building. Artist and curator – Rubadiri Victor, listens attentively to COSTATT students, who posed questions to him about his art work. He has been walking that lonely road for a long time, dreaming about his vision for an artistic space for the youths them. Grappling with finances, rich in intellect and a passionate love for the arts, those who engaged the arts and cultural spaces with him – will remember Rubadiri Victor walking home from the capital city, Port of Spain to his home in Carenage; with his bag of work and ideas thrown over his shoulders, visibly talking to himself. One could not tell at the time, if Rubadiri was a man and an artist in love with the way his mind works, or if the Orisha devotee and spirit man was having a conversation with the deities or the divinities, as some practicing Orisha folks will say; could have been both. That was over fifteen years ago. What we are seeing now, over fifteen years later, is the literal mind of Rubadiri demonstrated in splendid art exhibit, and a spiritual being who has grown through the Orisha ranks. Today, some call him Baba. Attendees to Rubadiri’s art exhibition mimic the pose of the characters in his master piece. Rubadiri can be seen third from left, doing his thing. Out of respect for other people’s religious and spiritual beliefs, Rubadiri does not foist his spirituality or religion on others. Instead, he spent his mind and his time in activism, trying to get the elite and others to see the value in preserving and building spaces for people involved in the arts and culture. As head of the Artists Coalition of Trinidad and Tobago (ACTT), Rubadiri risked the dirt of sacrifice, burying his dream as a painter and artist, to brave the high winds of capitalism, trying to sell the idealistic concept of people with money pumping their millions into the creative sector, to help create a better world and trying to get governments in this energy rich twin isle Republic of Trinidad and Tobago, to see the value in investing in the creative spaces as part of a diversification plan, away from oil and gas, the country’s main revenue earner, long talked about. Rubadiri has been doing this for the past 17 years. A sacrifice that saw him put down his art tools and almost relinquished everything, to do battle against the capitalist system that threatened the life of the arts. Rubadiri picks back up his paint brush after 17 years to make a statement through his art work and his paintings. Certainly there is the question of how 17 years of activism and as they say: fighting the system may have impacted the livelihood of this artist. “Obviously, I’ve impoverished my family beyond belief, you know; I’ve sacrificed beyond … you know … I’ve changed the course of my family’s life, by that decision. Um, but it was what had to be done and there is no other way, because the traditions which I hold dear, which this country holds dear were in jeopardy and um, they needed a champion and nobody else was going to do it” Rubadiri explained. 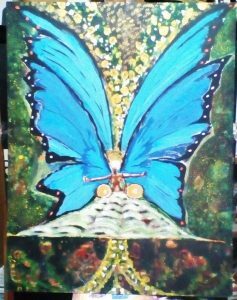 Putting wings on Caribbean consciousness, Rubadiri the spiritual man paints images he refers to as Caribbean Arch Angels. What does the golden and independent age generations and the elite have to do with it? Rubadiri the Orisha devotee, seen here about to do his devotion before the sea. Immediately visible, is a bell in his right hand. The secret squadron master piece took hundreds of man hours, according to Rubadiri. Imagine then the amount of mind, soul, spirit and effort that went into painting one hundred and one pieces. “It’s the culmination of a whole series of arch angel pieces that happened over a period of three or four years. And so that is the way that the wings were resolved and what is in the wings. The way I was processing Leroy Clarke’s work at that particular point in time. You know – the iconography that has been instilled into the infinity and the different poses and that kind of stuff. So the things are worth that stuff”, meaning the cost — Rubadiri explained. One of his noted skills taught to him by the Elders, that he always talks about, Rubadiri’s mas camp, as noted on his Facebook page, “The Generation LION Mas-camp is now at the Corner of Picton Street and Tragerete Main Road in Newtown at the soon to be opened ‘Backyard Restaurant & Sports Bar’. The space is the site of the just completed mural ‘All That We Cannot Leave Behind- tribute to Traditional Mas’ by LION band leader, Rubadiri Victor. Registration will be upstairs in the VIP section. The Restaurant, Mural, and Mas-camp will be (was) officially launched on Thursday 25th January 6-9pm. Register now 1-868-797-0949 or 486-9985. Some of the COSTATT art students who attended Rubadiri’s art exhibition, listens to the artist explain his thoughts behind his paintings. 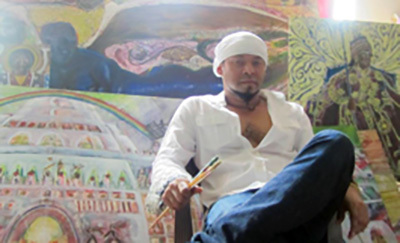 Rubadiri used his space in newspaper columns and his Facebook page to express frustration about the elite’s insensitivity towards the art form and their apparent lack of consciousness for the valuable work the golden age generation has done and how the various genres of the creative industries and the arts can make Trinidad and Tobago a healthier space that can spark better thinking in its people. The graciousness of the man sees him remembering the few elites that sees the value in the country’s artists and have even created spaces for them to build their skills as artists. When the elite and the government politicians and other stakeholders treat these cries with their silence, what then? “We have to continue to do the work,” Rubadiri half-heartedly accepts. “I did this work without knowing if there is any patron, for anything that I’ve done. So I would have invested tens and tens of thousands of dollars in this work, and especially completing it seventeen years later where I have no audience, I have no connection with any of the people who buy paintings now.” And this was the consequence of relegating his career as a painter to seventeen years in winter land. But to Rubadiri: “This is a self curating exhibition; I am not even connected to the gallery, (Bosco’s 101 art studio), so their list is not even available to me. This is me staging this on my own dime, on my own stuff, risking and putting it out there – um, and it is a challenge. I have to do it. I have to complete that statement I started, seventeen years ago, and so yeah, and so part of it again, is a challenge for that same elite to step up to the bar, to come to the space, if they don’t uh, there is nothing I could do about it, the work has to live, it has to find”, Rubadiri asserts. 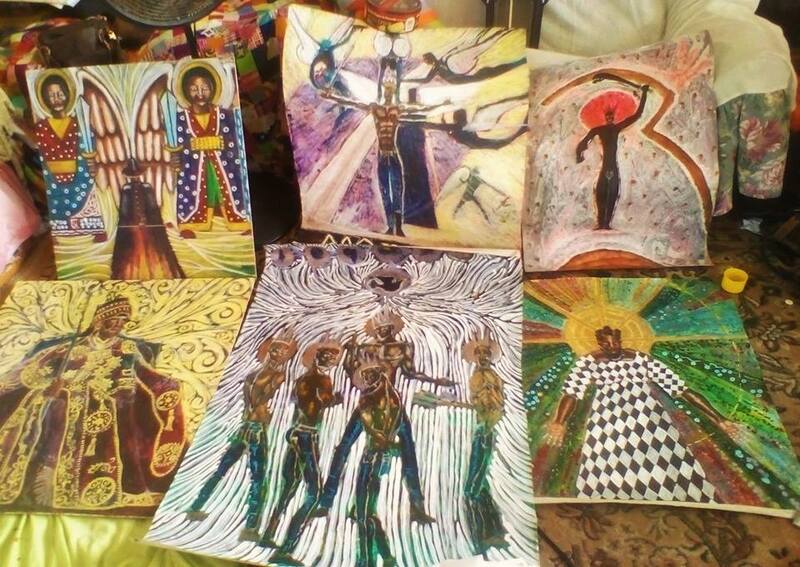 THE ORISHA SERIES: Eyemanja- Goddess of the Sea; Oshumare- Goddess of the Rainbow; Oshun- Goddess of Rivers; Eshu- God of doorways, choice, and opportunities, watcher at crossroads, messenger of the Gods; Shango- God of Lightning,the Dance, of Life-Force itself; Shakpana- God of smallpox, madness, and many skin diseases… All in that order from left to right. Conscious of the deep concentration and depth of work of all artists, Rubadiri believe his and other such material should be situated in institutional spaces where the public sees it. “And because it is work, it is intellectual property, and because it takes physical labour to do that,” he emphasized. Most of the paintings are under TT$10,000 dollars or US$ 1,483.11. Two of the painter’s most prized pieces – costs TT$77,000 or US$11,419.93 and TT$101,000 or US$14,979.38. “That price is a mark of the seriousness of it” noted Rubadiri and he prefers the client who is taking those paintings to be serious about it, and to understand the integrity of the work. COSTATT student, Mariella Francis became consumed with the painting from the initiation series, Niggas to Negus/ Gangs to God’s. Check out The College of Science, Technology and Applied Arts of Trinidad and Tobago – COSTATT art student, Mariella Francis gazing at Rubadiri’s painting. She said it is “neo classical, influenced with impressionism.” To her it meant freedom of the slaves and told this reporter that this particular piece of art work stimulated her thoughts about her own projects at the college. “This is how I like to see people pouring over a painting, investigating, interrogating, and dissecting it. The young girl had a very interesting take on the piece- just as had an earlier young girl visitor of her similar age,” Rubadiri said smilingly. “They’re escaped slaves!” She said. It’s about Infinite Freedom… I said, “You’re correct!! !” The artist quoting the other young woman’s interpretation of his painting. The COSTATT students were among several groups of people who showed up on different days of Rubadiri’s one week art exhibit, to view and critique his art work. Two pieces from the Initiation series- ‘Dog to God’ and ‘ Niggas to Negus- Gangs to Gods’. The transformations we witness in the paintings are happening in the interior of the Temples of the exhibition title., Rubadiri wrote on his Facebook page about these two paintings. Like his mostly casual and sometimes semi casual attire, Rubadiri keeps his art real, with no pretense, allowing every muscle in his being to flow with the freedom of the universe; his body, mind, soul and spirit gushing into every brush stroke. The man, his paintings and with paint brushes in hand, Rubadiri is captured here in front of his paintings as he pondered the prospects of holding his art exhibition someday. A dream finally comes true. Artist, musician, singer, curator, mas and carnival man, educator, spiritualist, Rubadiri spent years loving and working in the corridors of the creative industry, to primarily uplift lives and to literally save generations from being lost in the jungle of convolution, that is now our world. One hundred and one paintings of Rubadiri Victor’s best work were on display at Holder’s studio, Gallery 101 from 28th November to 3rd December, 2017. Those paintings were a dream fulfilled. And now, Runadiri is a man ready to soar, dusting off his dreams and living it. JAH 1′ & ‘JAH 2 both 45in x 45in- Acrylic on canvas’ – Two different takes on the Supreme Divinity. ‘Our Lady of the Drum’… Acrylic on hard board. Happy Odun Ijesu/New Years! My first exhibition in 17 years entitled ‘Build the Temples for the Youths Dem to Enter’ opens on Tues 28th Nov @ 6pm at Gallery 101 on Woodford St POS. Come down! We Do Not Shake Hands with the Beast.’ from the ‘Rastafari Resurrection’ series. Rubadiri the folklore man: The Imps chase The Boy… From ‘The Boy & His Dog’ a rendition of a folktale my father told me as a child that I’ve never encountered elsewhere. A Boy lives with his Grandmother on the edge of the Forest. He does a good deed for an Old Man and is given a gift of a puppy. The Dog turns out to be Magical. Whenever the Boy is in trouble a bucket of water turns to blood and the Dog comes to his rescue… There is also a Witch that eats little children… WIRE BEND Folklore Theatre (https://www.facebook.com/wirebendtt/) continues to produce LOCAL FOLKLORE AS YOU’VE NEVER SEEN IT BEFORE- interactive animation, brilliant artisan costuming, larger than life puppets, and brilliant staging… Check out and like our page. Rubadiri in the moment – few years ago.